Please share this with all your creative friends and family! Look for the most current news from our club. Christmas is coming up very soon! Setting up to start at 11am. $5 per person to be pre-paid. There will be a Raffle and Lucky Door prizes. Thank You to everyone who has taken the time to volunteer and help with all of the clubs activities. Also it has been a joy to share the activities , you can’t accomplish what we do on our own. Happy Thanksgiving! Christmas is around the corner. Good luck with preparations everyone. I have a great deal of catching up to do. First thanks everyone on the open day. You had a lot of very kind wishes for me. ####Please find listed below some important dates which were not published in the Newsletter. - 15/12/2018 at 12 noon the Club Christmas Party begins. Setting up starts at 11am. $5 per person to be pre-paid to assist with catering. Please bring a plate of cakes, slices or savouries and dip or a plate of food to help with the lunch. - 22/12/2018 is the last day in 2018 the Workshop is open. - 12/01/2019 Club workshop re-opens in 2019. - 26 & 28/01/2019 Club workshop is closed for Australia Day Public Holiday. - 8/12/2018 is the next Management Committee meeting – 9am to 10am. Workshop open at 10am. A very safe, yet Magical Christmas and New Year to you and your families. days news!!!!! Upcoming events- pass it on. Share on FaceBook and Instagram and Twitter. We have several events through the year that can be enjoyed. Sorry if you were not able to attend. 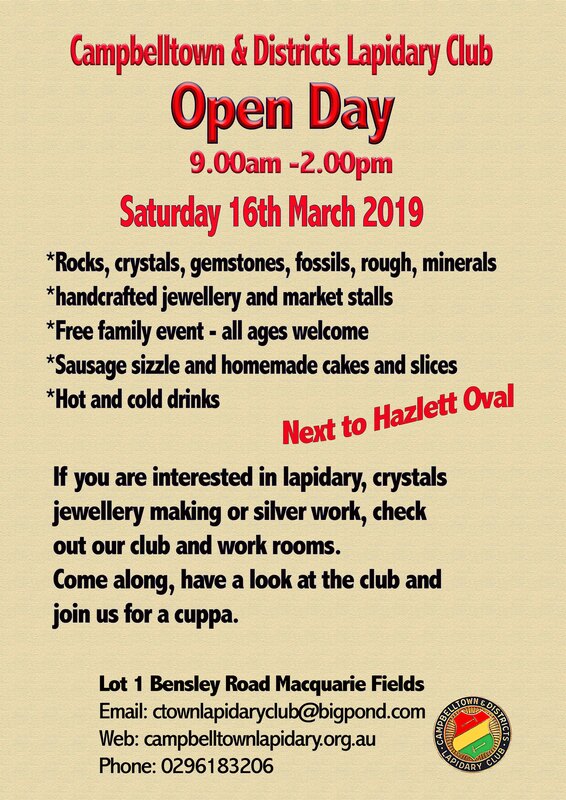 Just a quick email to inform you that a commercial Opal Miner will be visiting our Club to display and sell Opal rough and cut Yowie nuts. Prices for the items on sale range from $15 to $200. This chap has approached our Club to show and offer his goods for sale., the Club has not approached him. If you are interested, he will be at the Club Rooms on Monday 8/10/2018 from approx. 10:30am for a couple of hours. As several members are in lightning ridge digging dirt, casting will not be on this friday night. Next week casting open as usual. ******SAT, OCT 20 AT 9 AM, please see more in the Newsletter and previous posts here. Please copy and print out flyers to share to others who would like to see how our club works. Please share for those you know who cares! Please feel free to print the flyer and distribute to your clients and colleagues. We would love to see you there. Other news is the AGM (Annual General Meeting) is coming up. Please feel free to nominate members for positions. Please leave your suggestions on the noticeboard at the club. Remember Margaret is leaving her position. She needs a gold medal for her work over the years. Don’t forget to thank her personally. Also, pay your fees. its very important for insurance coverage. You will not be able to use the machines if we can not give you coverage. The newsletter for September will be coming soon. John has done a wonderful job with August’s newsletter. I personally am looking forward to Septembers news. Can you believe it? August already! The exhibition went very well. Thank you everyone who helped make it a success. we owe you all for your time and effort. August will be a busy month. Important to note fees are due.You need to pay asap. A small amount for use of a lot of equipment and knowledge. Please check the newsletter for more information. The Annual General Meeting ( AGM ) will be soon, that is when officers are elected. if you have someone who might be a great duty officer or VP or even President, sign them up. Our lists are on the notice board. See the newsletter for more! Margaret has stepped down from her position and another person will need to fill the spot. Thank you Margaret for the years of care and attention you have given. If you did not know Margaret was also known for bringing in a few trophies for her newsletter work when she took over from me- before myself Clarice was our newsletter editor and writer for many years. It is a valued position. John, thank you for filling that spot after Suzy! Newsletter writers are always looking for submissions. If you have something to say for example a favorite spot to find gemstones or a joke to tell please pop it in the email or leave it on the sign in desk, submissions are always happily welcomed. If you are interested in joining our club please call and or just visit on a day we are open. Phone messages will be answered. 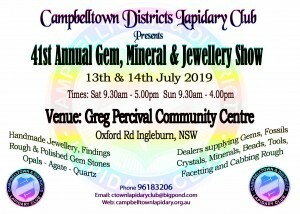 Hi there Lapidary Members. I haven’t had very much luck with my health so if you haven’t seen me here it is for good reason. Best wishes for everyone. Please don’t forget the Exhibition. plenty to see, buy and lots for the family. Come have a cuppa and a sandwich or cake. 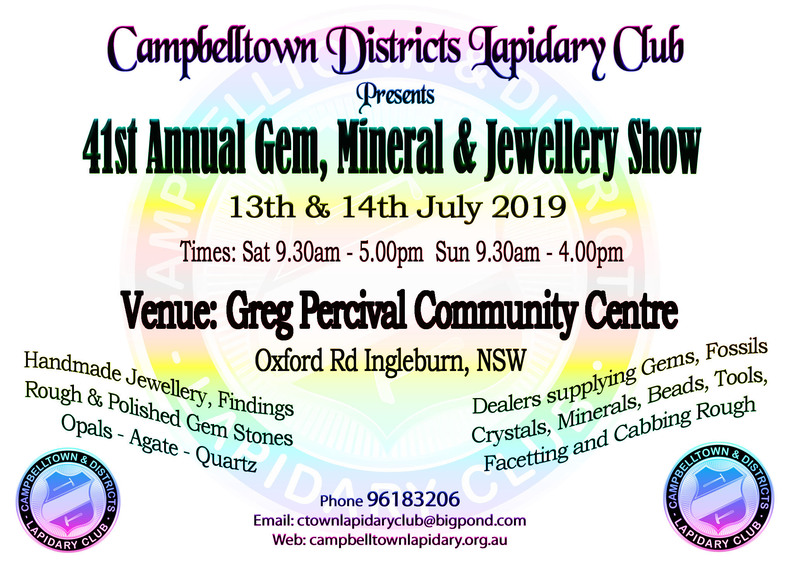 We have some of the best opportunities to buy minerals, rocks, handmade jewelry and other goodies in Western Sydney. We are in the process of preparing for our Exhibition.  Volunteers are needed to assist on the day.  A limited number of Display Cases are available for Member’s work (One per member). Please see the Notice Board.  All the above are shown on the Whiteboard. Please check there for more details.  Flyers have been distributed. Elizabeth and Margaret encourage one or more Club Members to step forward and take over the Event Co-Ordinator role. feel free to ask Margaret for what is involved as Co-Ordinator. ***I have to repeat I am sorry for any delays. I have had one heck of a time with my health. Please feel free to email me or the club. a good old fashioned land line call will be nice too. I hope you enjoy the exhibition. Plan the best days a person wanting to make Rocks into Gems ! The Exhibition is coming up! 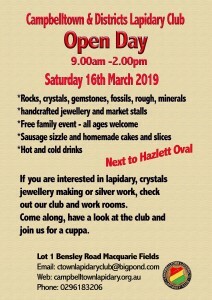 Then shortly after that we have our second open Day Sausage Sizzle this year. Rocks Minerals Jewellery findings and fun! More information in the Newsletter! Just a suggestion! Put this on your phone calendar. You may want to give yourself a heads up the week before! **Membership renewal is due on 1st July each year.